Wildlife in the City: Unexpected Nature — . The world is an incredible place. That’s one reason why we love to travel. Yet, sometimes the incredible can be found right in your own backyard. We live in Portland where over 2.4 million people call this metropolis home. Most would think that in an urban setting such as this, that no wildlife would be running around except for the occasional squirrel. Not true. There are rabbits. 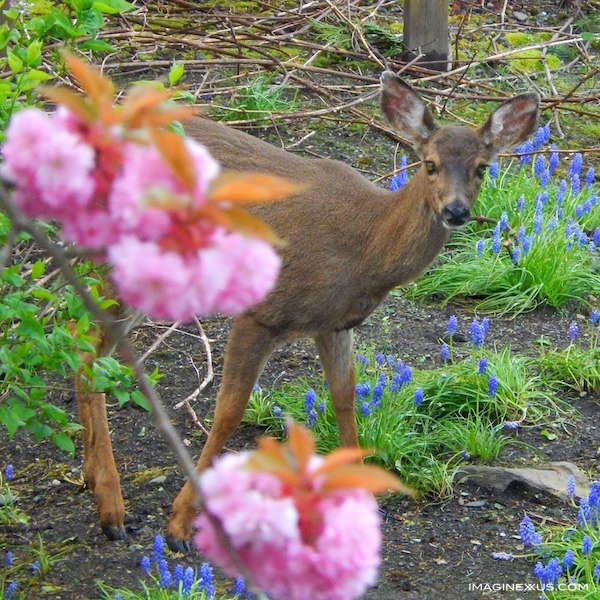 One whom we’ve named Darrell lives under one of our rhododendron bushes. Coyotes have trotted past our deck upon occasion. (Watch out, Darrell.) And then there are entire families of deer who meander through our yard from time to time. It always catches us off-guard whenever deer decide to wander around our neighborhood. We don’t live in a concrete jungle, but it’s not exactly the boondocks. The deer step gracefully across the lawn and stop for a munch of grass. Then they move down to the neighbor’s driveway to pluck some flowers before moseying along. A gentle and unexpected reminder that nature’s all around. If you enjoyed this story in our series, you may also enjoy two other stories about unusual occurrences in the Portland area with a super moon and snow or any of our books.